If someone had said to me 5 years ago that I would soon be spending as much time unbuilding links as I did building them I wouldn’t have paid them much heed. The belief back then was that google would never punish you for what happened off your site – that is after all (supposed to be) outwith your control. Fast forward to 2014 however and that’s exactly where we are; the first job of an SEO often being not a creative one, but more a task of (to quote Quantum Leap) ‘putting right what once went wrong’. Since the rollout of google Penguin in 2011, bad links can kill your site’s organic search traffic stone dead and the task of link detoxing has become an integral part of modern SEO. How Will You Know You’ve Been Hit? While a link audit is something you should carry out periodically regardless (good SEO practice), it becomes an absolute necessity if your site has been hit with a webspam penalty (either algorithmic or manual). There are several ways to identify a penalty. So, that’s straight forward enough, but what if you’ve been hit by an algorithmic penalty? The first sign of an algorithmic penalty will be a sudden (and often severe) drop off in traffic. So, assuming there are no obvious reasons the next thing you will want to do is check if there were any algorithmic updates which tie in with the drop in traffic. Moz keeps a record of updates (as reported and observed) here. If your drop in traffic aligns with a penguin update then it is likely you are being penalised for over-optimisation, the biggest cause of which is manipulative linking. Now that we suspect our site has been penalised it’s time to conduct a link audit to identify potentially toxic links. There are a couple of tools which will help to automate the process (link detox by Link Research Tools being the most popular), but for the purposes of this tutorial we will conduct a manual link audit. 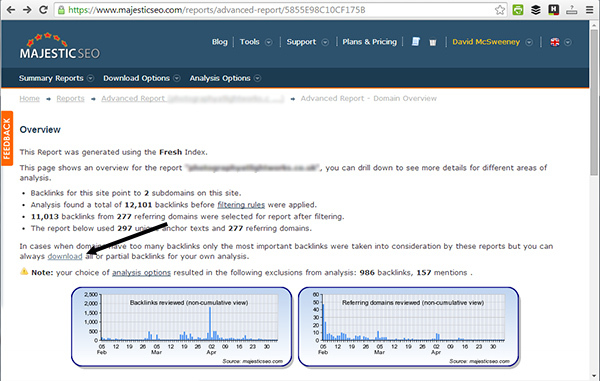 I will be using Majestic SEO for the analysis. Can’t I Just Use Webmaster Tools? While google webmaster tools does contain a link report (Search Traffic > Links To Your Site), this is actually just a sample of the links google has found pointing to your site. To ensure we identify all potentially problematic links we need to be thorough and for that you will need a subscription to one of the specialised backlink analysis providers. 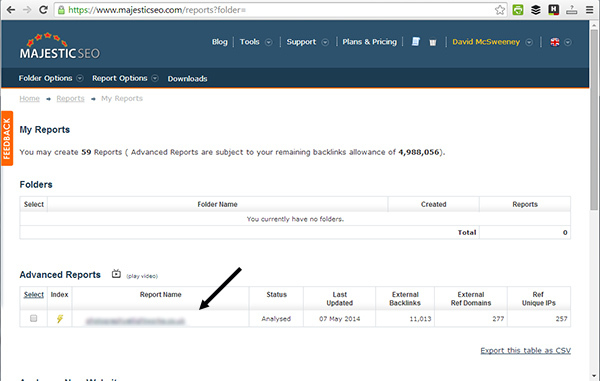 3) Select ‘Advanced report’ from Report Type and ‘Domain’ from ‘Report Cost’. This will ensure we are exporting all links to the domain. 4) The report will show in your ‘Reports’ page. 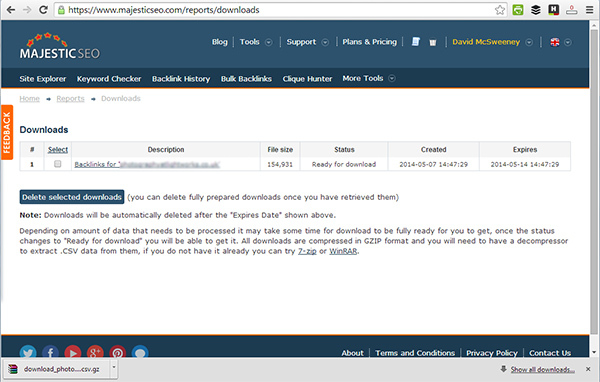 5) Click on the report and then on ‘download’ (shown below) to export a full list of links. 6) You can then download a csv of the backlinks from your ‘Downloads’ page. Before we start looking through the links let’s make the spreadsheet a little easier to manage. Majestic SEO gives us all sorts of useful metrics in the export, but for now let’s keep it simple. All we really need is the target URL (i.e. the page on our site) and the source URL (the linking page). Get rid of the other columns (or hide them) and then sort the data by source URL. It is often the case that there will be several links from the same domain, so sorting in this way will make the analysis easier. Your spreadsheet should now look something like this. It’s now time to find the toxic links. What Makes A Link Toxic? When assessing the quality of a link there are a few things you should be looking out for. Let’s break them down. Do You Recognise The Linking Site? If you recognise the linking site, then that’s a good start. Obviously any natural links you have picked up from authority sites in your niche (or absolute authorities such as the BBC, newspapers etc) are bullet proof. There may however be links in there that you have built yourself and recognise (guest posts for example), which possibly need to be looked at (more on this in a moment). Do You Trust The Linking Site? If the site looks like spam then it probably is and it’s probably not going to be a site you want to have included in your link profile. A good question to ask yourself is ‘would I feel confident in giving my credit card details to this site?’. Brian Dean has a good article on trust here. Is The Linking Site Topically Related? If your site is about cats and you have a lot of links coming from car insurance blogs, that’s probably not going to look good. Not every link will be thematically related, but generally sites will tend to link to related sites. Does The Linking Page Contain Links To Topically Unrelated Sites/Pages? If your link is included on a page with lots of other links to topically unrelated sites (which are not in context), then it’s probably one you want to get rid of. Does The Link Come From Within Content? Footer/sidebar links aren’t always bad, but generally links from within content will be safer and are more likely to be editorial. If you have a link in a sidebar which looks manipulative (i.e. an exact anchor text match) then it is probably harming your site. Exceptions might be a blogroll for example with branded (i.e. the name of the site) links to topcially related and authoritative sites. The days of guest blogging as a scalable link building tactic are over (see recent high profile de-indexing of guest blogging networks). High quality guest posts on trusted sites are fine (a good litmus test is whether the guest post is sending you referral traffic), but if you have built a load of anchor text links through low quality guest posts, then there is a good chance that they will now be damaging your link profile. Well written, genuine comments on high quality sites are one thing (and a good source of referral traffic), but if you have been building comment links through automation, then you will need to get rid. If your site has a number of low quality links from forums (profiles or signatures), then these are likely to be hurting your rankings and will need to be removed from your link profile. Too many anchor text links (i.e. the exact phrase you are looking to rank for) are likely to cause a penalty. It’s just not natural looking. See this article from moz on anchor text distribution for more. Work your way through the links on the spreadsheet, using the guidelines above (again trusting your instincts) and highlight the links that you feel may be damaging your link profile. Collect contact details (where available) for the links that require to be removed and add them to a ‘contact’ column on your spreadsheet. It’s now time to to start removing the toxic links from your profile. We’re going to start by reaching out to the linking sites and asking for the links to be removed. We have recently received an unnatural links penalty and I was wondering if it would be possible for you to remove (or nofollow) a link to our site on one of your pages. The link is on this page (their page) and is pointing here (your page). Thanks for linking to us, but I am sure you understand that I need to do all I can to get the penalty removed. I’m just following up on my email from (the day you sent the last one, i.e. Friday) regarding removing a link to our site. I would be grateful if you could let me know if it would be possible to remove the link as otherwise I will need to include it in our disavow file to be submitted on (date at least 3 working days in the future). To improve the success rate of your link removal outreach make sure that you use an email address from the domain they are linking to. Some webmasters will be rightly nervous about emails like this (fake link removals are a common tactic in negative SEO) and will want to verify you are genuine before proceeding. An email at the domain will go some way to establishing trust. You might also want to include a contact telephone number. If you receive an email back from a site telling you that they have removed the link, then firstly double check that it has been removed and then (assuming all is ok) add a ‘yes’ into the ‘Removed’ column for the link. 4 working days after sending your final outreach email, you will need to check the sites you have not received a response from to see if your link has been removed. Unfortunately not everyone will send you an email to confirm! If the toxic link is still in place then add a ‘yes’ to the ‘Disavow’ column for that link. As we have made a genuine effort to have the links removed, it is now time create a disavow file for any remaining toxic links and upload it to google. Sort your spreadsheet by ‘Disavow’ and then by ‘Source URL’. Create a new text document in your preferred text editor (i.e. notepad) and copy all the links that have a ‘yes’ in the disavow column into the new document. Your finished disavow file should should look something like this. For more on creating your disavow file, you can read google’s guidelines here. To upload the disavow file to google you will need to be logged into the google account associated with your domain. Once logged in go to the disavow tool here and select the domain you wish to disavow links for. Click on ‘Disavow Links’ and then upload your text file. You have successfully uploaded your disavow file to google. The final part of the process of link detoxing and penalty removal is to submit a reconsideration request to google. You should keep this request short and to the point. Explain that you have taken steps to remove the toxic links to your site and have uploaded a disavow file for links where removal has not been possible. You can submit a reconsideration request here. If you have followed the steps above you have done all you can to remove the penalty and it’s now a case of waiting for a response from google. Assuming you have removed all the toxic links from your profile you should start to see your traffic recover in time, although you may have to wait until the next Penguin update if the penalty is algorithmic. With a clean link profile, you will be in a position to start building the strong, authority building links that will increase your organic search traffic and keep you safe from future google updates. If you have any questions on link detoxing then please feel free to leave a comment below. Also, if you have experience of recovering from a penalty after conducting a link audit then I would love to hear about it! If you have been hit by an unnatural links penalty and would like help conducting a link audit and cleaning up your link profile then I offer the service as part of my SEO consultancy. 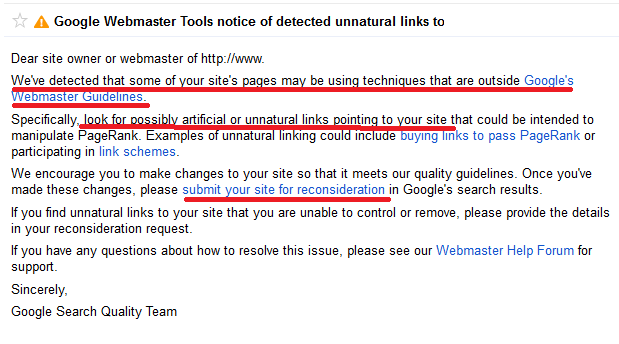 Well to be honest I haven’t got any fishy complaints from google about the penalty of site or links. I’ve been really serious about it. Recently one of my friend’s blog has been affected and the blog traffic is dramatically increased from thousands of hits to zero. I guess this tips would be really helpful to implement. Great post indeed. 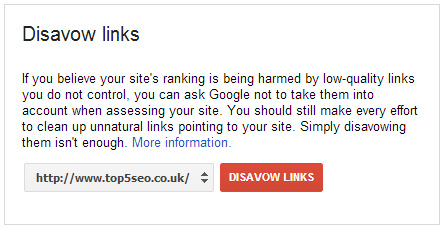 You can also use Disavow Links Tool by Google to remove those toxic backlinks. Can you recommend any free tools that do analysis? They’re really hard to find and I just cannot afford to spend hundreds on tools and analysis.